If watching people watch computers is your idea of fun, you are going to love Geostorm. 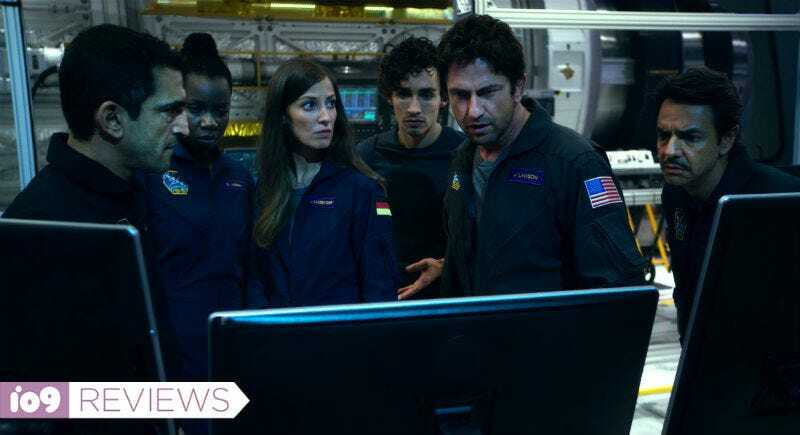 The directorial feature debut of Dean Devlin, who produced Stargate, Godzilla, and the Independence Day movies, Geostorm is a film that really wants to be Independence Day by showing destruction on a global scale with iconic heroes saving the day. But it’s not. 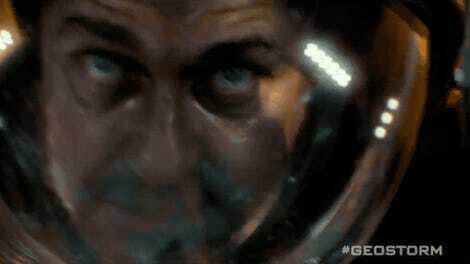 Instead the whole thing is a muddled mess peppered by action scenes that are few and far between. Set a few years in the future, Geostorm is about a massive, high-tech net of satellites humans have built around the Earth used to diffuse extreme weather. Massive hurricane coming? Flood? Tornadoes? These satellites will shoot a few charges down from space and stop them. It’s nicknamed Dutch Boy, because it’s plugging a massive problem with one metaphorical finger, and it’s working great. Dutch Boy was created by Jake Lawson (Gerard Butler), who, three years before the US system is set to be transferred to international control, is fired from his position by his brother Max, played by Jim Sturgess. However, when Dutch Boy starts causing the violent weather instead of preventing it, only Jake can go back into space to solve the problem. To do so, Jake and everyone else around him has to cut their way through a grossly overcomplicated plot with political angles, hacking narratives, familial conflicts, love stories, and so much more. And they do virtually all of this on computers. Geostorm has so many people watching computers, televisions, monitors, video phones, and other screens that it’s infuriating. Look below—these stills are all provided by the studio, meaning these are how it chooses to promote and explain this movie to the public. Don’t miss a single one. Good thing watching characters watch screens is super cool and exciting, right? If this was only part of the movie, maybe it would be okay. But instead, it’s the bulk of it. While we’re wading through this stupid, useless plot, the disaster the movie is promising gets the short end of the stick. Those scenes are layered in almost like corrections. There’s a hunk of plot and melodrama, computer, computer, computer, plot and melodrama, then a big, effects-driven disaster. It’s almost as if Devlin suddenly realized “Oh, right, this is an action movie” and put the scenes in to break things up rather than drive them forward. That pattern basically repeats over and over until the credits roll. It’s horribly unbalanced, and all it does is slow down the main drive of the movie, which is figuring out who is using Dutch Boy to cause natural disasters. If you were hoping that the film’s big-budget special effects would save the day, I have bad news. They just don’t feel that much bigger or better than what Devlin was doing 20 years ago. Even more problematically, the disasters don’t escalate; in fact, some of them toward the end feel smaller than the scenes near the beginning. The best thing you can say about them is that they serve as a welcome respite for the very boring in-between parts. The stupidity of the story would be much more bearable if the movie didn’t take itself so seriously. Any fun you might have had watching this story unfold is just sucked out of the movie by its solemnity. The one person who seems to know they’re in a big, dumb, disaster movie is Sturgess, but unfortunately the result is he stands out like a sore thumb. There’s never a scene when he’s not completely exasperated, hair all messy, clothes disheveled, shaking his head at the insanity that’s about to befall him. It’s the perfect performance for a movie like this, but because he’s the only person doing it, it’s uncomfortable. Meanwhile Gerard Butler does a great job playing Gerard Butler, Ed Harris and Andy Garcia are in the movie for some reason, and Abbie Cornish spends the whole movie trying not to laugh. Geostorm also wastes several more awesome actors, like Alexandra Maria Lara, Daniel Wu, Zazie Beetz, and Eugenio Derbez. Geostorm is bad. It’s convoluted, it’s slow, the action isn’t that special, and the whole thing feels like it was pieced together with some scissors and glue. The one saving grace you could have seeing the movie is going to something like a 4DX theater where the action scenes become a roller coaster, complete with water effects, smoke, strobe lights, and more. Maybe they would help you momentarily forget how much of the film is basically watching people watching screens. However, once you step back into the real world, all you’ll be able to remember about Geostorm is just how bad it is. There&apos;s Finally A Movie About The Geo Storm! Wait, Geostorm Is a Disaster Comedy Now?